Hey everyone! My internet friend Jess offered to write a guest post for my blog – how awesome is that?! She recently revamped her blog, focusing now on self love and overcoming diet perfectionism. Both are extremely important topics that I have been itching to write about, but Jess beat me to it and I’d love for her to take the stage. 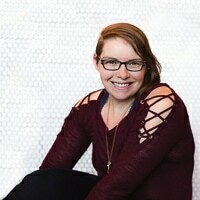 Be sure to visit Jessica’s website for more insights! My name is Jessica and I am a recovering paleo perfectionist. I recently shared my story on my site, Seek Your Journey, and I want to share some tips with you if you find yourself similarly struggling. Paleo perfectionism is a tough topic to tackle sometimes because it is so rooted in “health”, and there’s a fine line between “health” and obsession and fear these days. I’ll admit, I was terrified of eating certain foods because of the potential health consequences that I’d read so much about in all my paleo books. But you see, the real root cause of my paleo perfectionism wasn’t due to seeking optimal health. I don’t have celiac disease or any real food sensitivities that manifest immediately, therefore I really didn’t need to be so scared. I’m 21 years old and have always been in pretty good health. The real root of paleo perfectionism is fear. Well, fear and other deep-seated emotional issues. This may not apply to everyone dealing with paleo perfectionism, but I found myself using food as a way to ensure “optimal health” which for me was feeling 100% awesome all the time, physically and mentally. If I felt tired during class when I thought I had slept enough, I immediately thought about the food I ate and how to hack my sleep that night and what to eat the next day to feel better. If I felt a little bloated after lunch, I got upset at my body for its apparent inability to handle normal paleo foods perfectly. If I got suddenly really sad one day, I looked back to see if I had accidentally consumed gluten (despite the fact that it doesn’t have this effect on me…I had just read about it). Now, this doesn’t seem awful on the surface. It’s fine to want to feel awesome all the time. But in my case, and in the case of many others, I was seeking something that didn’t exist through food. I was seeking relief from my emotional fears, pains, and struggles (which I believe manifested to some degree in physical discomfort). I was so scared of these discomforts that I felt like I had to be perfect with my food to heal/ignore/distract myself from them. It worked for a while until it didn’t anymore. And I had to deal with it. And this is what I found. 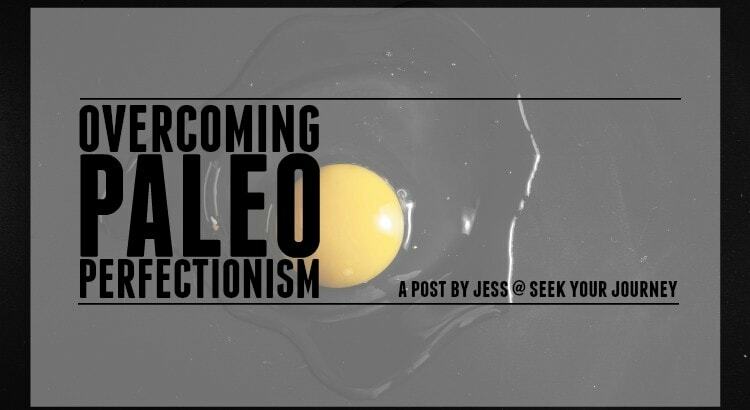 The #1 thing you can do to start overcoming paleo perfectionism… EAT THE FOOD THAT SCARES YOU. Do it. Eat it. If you feel crappy, whatever. Drink lots of water and realize that you survived whatever consequences you were so scared of. Obviously if a food makes you violently ill, don’t eat it. I’m not telling people with celiac to eat bread. This is about the food that is relatively harmless in moderation that you are terrified to eat for whatever reason. You don’t have to eat it every day. If it doesn’t make you feel great, obviously you should tend toward avoiding it. But eating it and realizing that you are still alive is exposure therapy. It’s exactly how phobias are treated because paleo perfectionism is based in fear. You may even discover that this food you feared doesn’t actually do anything to you. I went MONTHS without any dairy due to fear and then discovered that I can eat it a few times a week without any issues. Allowing myself to eat dairy and not fear it showed me that after about 2 weeks of daily consumption, my body tells me to stop. So I eat it in moderation and don’t freak out when I go out to dinner and there’s cheese on my plate. The same goes for sugar. Sugar is a BIG one for a lot of people. I understand that sugar in large quantities isn’t great for you, but I see so many people terrified of using any sort of sweetener in anything. For the vast majority of people, a tablespoon of honey in the sauce you’re making for dinner for your family isn’t something you should worry about in the slightest. Sugar was a big thing for me too. I was convinced for a while that any sort of carbs (whole food sources included) would give me major food cravings and wouldn’t fill me up. While I still believed that, it became true. Not because of the food itself, but because of my mindset. When I got sick of caring so much about food, I started eating more carbs because I really missed sweet potatoes and plantains. And frozen blueberries are my favorite dessert, but I had been restricting them because of the carbs. Isn’t that insane? I added mostly whole food carbs, but some candy and other processed sugars made their way in there too. I was originally scared about this, but I had gotten to a point where I couldn’t allow myself to restrict anymore. I was too emotionally and mentally exhausted to care. Funnily enough, the more I let go of this fear and the more I ate carbs, the more I felt satisfied with them. Just recently I moved to a new city with my boyfriend, and we got a nice driving tour from a nearby relative. She brought us to a french bakery where I had half a croissant sandwich, soup, and a sticky bun for lunch. A few months ago, this would have terrified me and I probably would have stuffed myself with almonds when I got home because I would have been scared that the processed carbs would leave me starving and cranky in a few hours. In reality, I was pretty full till dinner. I did get a stomachache and a headache almost immediately, but it went away within an hour. It didn’t kill me, and I got to enjoy a wonderful afternoon with my loved ones without the anxiety that used to go along with bread and sugar. I don’t claim to be completely over all of this, and I still have my struggles. But I am much further along my healing path than before, and it’s pretty incredible to see the changes. Although eating the feared foods is the #1 piece of advice I can give, here are some other tips to help you along the journey. Cultivate positive self-talk. If you eat a feared food then start feeling bad about yourself, you can actively combat it by telling yourself how wonderful and amazing you are. If you’re not comfortable with that, make a list of positive qualities and think about those. Sit with the discomfort. This is hard. Really hard sometimes. But paleo perfectionism tends to be a mask for deeper emotional issues, and when you stop allowing food obsession to mask the discomfort, other things will come up that may hurt emotionally. See what’s really down there and think about how you can work through it without including food. Practice self-compassion and self-acceptance. Don’t expect yourself to be “cured” right away. You may still have moments when you freak out about going out to eat or feel awful after eating a feared food. It’s ok. It’s part of the journey. Just be nice to yourself throughout the process and accept every moment exactly how it is. Focus on progress. Even on my worst days, I have such a better mindset than I used to be. In my calorie counting days (pre-paleo perfectionism), I CRIED before going out to dinner sometimes because I already had planned my food and my plan was ruined and I couldn’t fit my dinner into my calories left. Sometimes I still freak out about calories (the information never leaves your head…ugh), but I never do this anymore. I have improved leaps and bounds, and I try to remember this when I’m feeling down about all of this. Practice gratitude. This is a core practice for living a satisfying life. Most nights I write down what I am grateful for that day, and I can always go to sleep happy. It’s a great way to pull yourself out of a funk and lift your mood. You can’t keep feeling bad about yourself when you actively think about all the good things in your life. There is no quick-fix or pill you can take or food you can eat to deal with this. You have to put in the time and effort and deal with the uncomfortable feelings, both physical and emotional, that come with the process. But I promise that it’s worth it! If this post resonates with you, or you want to connect with me, I would love to hear from you! Check out my other posts at seekyourjourney.com or shoot me an email at jessica@seekyourjourney.com. Don't subscribe All Replies to my comments Notify me of followup comments via e-mail. 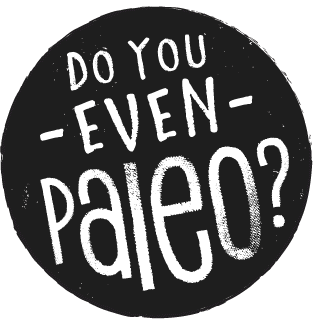 You can also <a href='https://www.doyouevenpaleo.net/comment-subscriptions/?srp=859&srk=87505361eee98908ddf6ccb8681f50d6&sra=s&srsrc=f'>subscribe</a> without commenting.